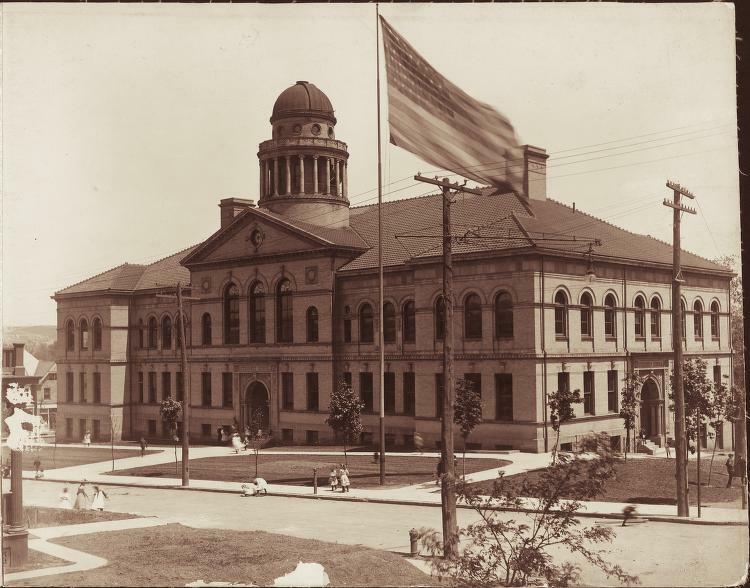 The groundbreaking and laying of the Andrew Carnegie Free Library building's cornerstone(which includes a time capsule), took place in October of 1899. The Library opened to the public on May 1, 1901; the first book charged-out for loan was "Triumphant Democracy" authored by Andrew Carnegie. The first concert in the Music Hall, performed by the Carnegie Men's Glee Club, took place on May 10, 1901. Andrew Carnegie was accompanied, on this trip to the Library, by well-known astronomer and optician, John A. Brashear. Brashear, who at the time (1901 to 1904) was Acting Chancellor of the Western University of Pennsylvania(now the University of Pittsburgh) when it was located on Old Observatory Hill in the City of Allegheny, Pennsylvania prior to the University's planned move to the Oakland section of Pittsburgh, had been Director of the original from 1898 to 1900. Brashear's company, also based on the Old Observatory Hill in Allegheny City(now Pittsburgh's North Side), was known world-wide as a maker of precision optical and scientific instruments. His factory building and his North Side home, both still in existence, are located next to each other and a block from the original Allegheny Observatory (less than a block from the former campus of the Western University of Pennsylvania; part of this campus was later used as the campus of the Ivey School of Art and is now used as the campus of the Triangle Technical Institute). The original 30-inch objective for the Allegheny Observatory's Thaw Memorial refractor telescope(built in 1914--the fifth largest refractor in the world and third largest, photographic refractor in the world) was made by the John Brashear Company(established in 1881-- it is now known as L-3 Brashear , based in O'Hara Township, about ten miles northeast of Pittsburgh). This original objective lens was replaced, in the 1980s, by a lens which is designed to observe light in the red end of the electromagnetic spectrum, which reduces the problem of light pollution from the lights of a major metropolitan area such as Pittsburgh; the original lens was designed to observe light in the yellow and green portions of the spectrum, which is much more sensitive to light pollution. The original 30-inch objective lens, produced by the Brashear Company, is now on display in the first floor hallway of the Allegheny Observatory. The Allegheny Observatory has free-of-charge evening tours(and some daytime tours) for the public, during the warmer weather months of April through October each year, when this lens can be seen, as well as one or two of the Observatory's telescopes. The Allegheny Observatory has a very interesting history, whioh is presented during the public tour. Observatory tours are by appointment only. Free appointments, between April and October, can be obtained by telephoning the Observatory at (412) 321-2400. The 30-inch Keeler Memorial reflector telescope(built in 1906), also at the new Allegheny Observatory, was also built by his company. In fact, John Brashear spent one Summer, at his Summer home in Muskoga on the Georgian Bay off of Lake Huron (necessitated by an illness of his wife, Phoebe), fundraising by mail for the construction of the new Allegheny Observatory on the new Observatory Hill, two miles north of the original facility. The cremated remains of John Brashear, as well as those of his wife (and those of former Allegheny Observatory Director James Keeler and his son), lie in a crypt at the base of the Keeler Memorial reflector telescope(and, this small crypt has two more spaces available for cremated remains!). The epitaph on the Brashears' spaces reads: "We have loved the stars too fondly to be fearful of the night." This line came from the poem, "The Old Astronomer to His Pupil," by Sarah Williams, which John Brashear and his wife both loved. The following is an excerpt from this poem; click here, to read the entire poem. Both of these Allegheny Observatory telescopes continue in use for Astronomical research, by scientists from the University of Pittsburgh. Their main research use is for gathering astrometric data, as a means to search for planets orbiting other stars. Weather permitting, the public can view objects through both telescopes during the Allegheny Observatory's annual open house evening(which is free-of-charge), usually held in the early Autumn. The Thaw Memorial refractor telescope can also be seen during weekly tours of the Allegheny Observatory(also, free-of-charge), conducted April through October. At the Nicholas E. Wagman Observatory in Allegheny County's Deer Lakes Regional Park(north of New Kensington), an 11-inch Brashear refractor telescope is used for free public star parties. The Nicholas E. Wagman Observatory is operated by the Amateur Astronomers' Association of Pittsburgh. Andrew Carnegie commissioned the construction of this telescope, in 1908, so that students of the Carnegie Technical Schools(now Carnegie-Mellon University) could view Halley's Comet in 1910. It saw first light, at the Wagman Observatory in October of 1992, after being in storage for decades. A four-inch Brashear refractor telescope is also used for public observing, periodically, at the Henry Buhl Jr., Planetarium and Observatory of The Carnegie Science Center, located on the north bank of the Ohio River on Pittsburgh's Lower North Side. The 37th telescope (serial number 37) built by John Brashear (circa 1900) for Dr. David D. Kennedy, this telescope was donated, by Mr. J.K. Foster on 1972 October 16, to Pittsburgh's original Buhl Planetarium and Institute of Popular Science, which is located next-door to America's first publicly-funded Carnegie Library along with the world's first Carnegie Hall: The Carnegie Library of Pittsburgh, Allegheny Regional Branch (formerly Carnegie Free Library of Allegheny). Another Brashear telescope was built for the School District of Pittsburgh and was originally housed in a dome atop the Sterrett Elementary School (today, Sterrett 6-8 Middle School/Classical Academy) in the Point Breeze section of the city. For many years, up until the mid-1950s, this was the official telescope of the Pittsburgh School District. 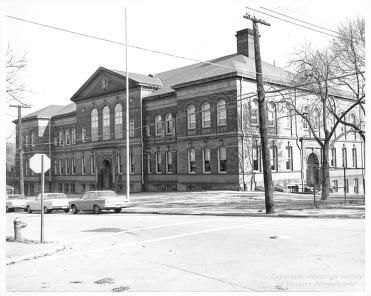 It is believed to have been stored, and used primarily, at the Sterrett Elementary School, and perhaps also used at Peabody High School in East Liberty--both in Pittsburgh's East End. Although some records indicate that this telescope was an eight-inch refractor telescope, historian Bart Fried strongly believes it was a six-inch refractor telescope, as John Brashear recommended to the donor, Henry Clay Frick, that this telescope be the same size as a telescope previously built and installed in Mount Pleasant, Pennsylvania (a Pittsburgh suburb in Westmoreland County, close to Henry Clay Frick's native home). Mr. Fried has found no evidence that a larger telescope was ordered. Financed by industrialist, philanthroplst, and John Brashear's good friend, Henry Clay Frick, this telescope was built around 1901 and installed in the new observatory atop the Sterrett Elementary School in 1902 or 1903. John Brashear's correspondence indicates that there were problems in the construction of the Sterrett School observatory, particularly regarding the dome and floor supports; apparently, an inexperienced contractor was responsible for this construction. This caused a delay in the installation of the telescope and opening of the observatory. For unknown reasons, this observatory was removed from the Sterrett School roof around the 1950s. The current school district administration has no recollection of when or why it was taken-down, or the fate of the telescope. Jean (Shrawder) Gerard, a grandmother born in Pittsburgh in 1914 who now lives in Cambria, California, well remembers the Sterrett School telescope. In an electronic mail message written to the author on 2009 May 2, she writes: "I was born in Pittsburgh in 1914 and raised on Lang Avenue in Pittsburgh's East End. My father taught geology at Schenley High School and I went to Sterrett School when Harry Brown, then a weatherman for Pittsburgh city, conducted occasional viewings of astronomical events using the telescope then housed in the dome of Sterrett School (since removed, I believe). I am reviewing my early history and writing specific narrative poetry about some of my early memories." John Brashear, while still a millwright on Pittsburgh's South Side, lived in a small house clinging to the slope of the South Side's Holt Street; he created a small workshop in his backyard. In his memory, The Brashear Association was created to assist the citizens of the South Side, particularly young people. A small Brashear Museum is adjacent to The Brashear Association's headquarters at Sarah and South 20th Streets on the South Side; the Brashears' epitaph, "We have loved the stars too fondly to be fearful of the night", can also be seen on the front of the museum annex building. As part of the Pittsburgh School District's "Great High School" project, Brashear High School, named in John Brashear's honor, was built in the city's Beechview neighborhood in the South Hills. This school replaced the aging South Hills High School(also a very large school), on Mount Washington just above the at-grade, South Hills Junction Station of the Port Authority Transit's Light Rail Transit subway system. and the oldest operable major planetarium projector in the world ! This Internet web site created 1998 May on web site domain < http://www.clpgh.org/andrcarn >. Updated and transferred to new web site domain < http://andrewcarnegie2.tripod.com > 2000 June 19.